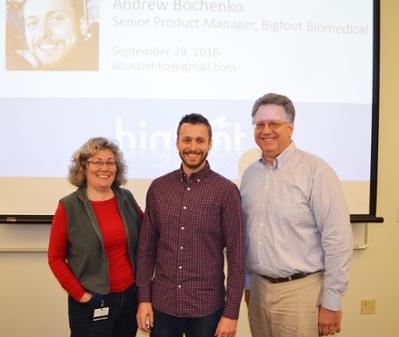 Andrew took time out of a cross-country trip to visit with CMTI students and BME undergraduates to describe his career path and current position as a product manager for Bigfoot Biomedical. Andrew had an interesting perspective to share, based on several internships, several years at Medtronic, and his current position where he is helping to launch exciting new technology focused on using smart phone technology to help patients with Type I diabetes manage their condition. It was fascinating to hear his comparison of life at Medtronic – the largest medical device company in the world – to working at Bigfoot Biomedical, which now has 26 employees. What a great opportunity to hear firsthand about what he has learned about the advantages and disadvantages of big and small companies! Andrew shared some great advice and introduced us to colleagues at the University of Rochester Center for Clinical Innovation. 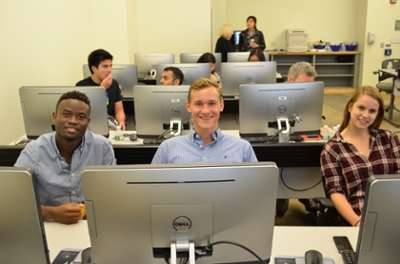 We wish Andrew and his colleagues at Bigfoot great success on their clinical trials!